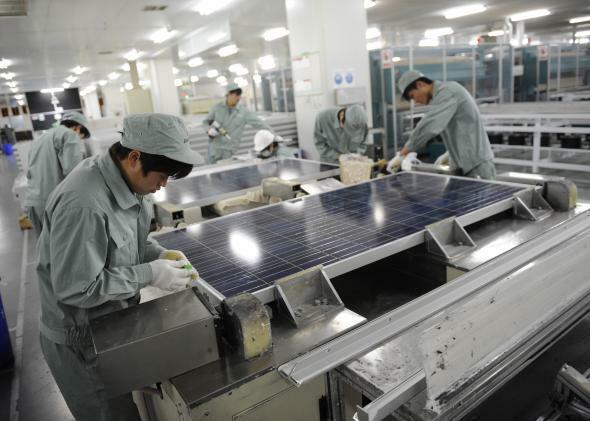 US slaps import tariffs on Chinese solar panels, escalates solar trade war. China Wants to Sell Us Cheap Solar Panels. Why Won’t We Let Them? The United States has imposed new tariffs on Chinese solar panel importers such as Suntech. Solar panels are about to get more expensive, and we have the U.S. government to thank. The Commerce Department on Tuesday slapped heavy new tariffs on importers of Chinese solar panels, ranging from about 19 to 35 percent. The import tariffs apply to panels made by six major Chinese manufacturers, even if the panels are actually assembled elsewhere. For an encore, the Commerce Department is expected to rule on July 25 on additional antidumping penalties. China’s crime? Subsidizing clean energy. The United States can’t abide governments meddling in the energy market in an attempt to make solar panels more affordable. Except, you know, when we’re the ones doing it. The decision stems from a lawsuit brought by a German company that makes solar panels in the United States and feels threatened by the Chinese companies that are making them in Taiwan. Why are they making them in Taiwan? To sidestep the tariffs we already slapped on the ones they were making in China. It’s the latest escalation of a dispute that I’ve dubbed, only slightly hyperbolically, the world’s dumbest trade war. Congratulations, U.S. government: You’re now heavily taxing imported solar panels at the same time that you’re heavily subsidizing their purchase. The losers in this battle include not only U.S. consumers, Chinese solar firms, U.S.-China relations, and humans who breathe air, but also U.S. solar panel installers like SolarCity and Sunrun, which employ far more Americans than the country’s relatively puny domestic solar-manufacturing industry. Oh, and whomever suffers if and when the Chinese government retaliates with tariffs of its own, as it did to U.S. polysilicon makers last year. The list of winners is much shorter. There’s the aforementioned German firm, SolarWorld AG, and its U.S. subsidiary, along with a smattering of other domestic manufacturers who were having trouble competing with cheap Chinese panels. But maybe I’m underestimating our strategy here. Perhaps it’s all a quietly brilliant scheme to stimulate the economy by creating new jobs for trade lawyers, lobbyists, and accountants, in which case, bravo. One suggestion, though: Maybe next time we could try this on an industry that doesn’t represent one of our best long-term hopes for a cleaner global environment. China Is Stealing America’s Solar Manufacturing Industry. Should We Fight Back—or Rejoice?